When it comes to home therapy type of products, there are many to choose from. Many of use already know the benefits of heat therapy and how it can help to relieve pain. 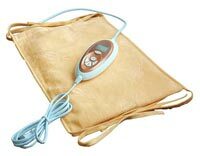 One of the many products that you can get is infrared heating pads. These pads generate a light wave energy instead of heating the surrounding air of the area on your body that you put them on. This helps to create vibrations in your cells which produce the heat. Although their could be some great benefits of using an infrared heating pad, some of the claims that are being made can be quite outlandish. Heat really can help to reduce pain and speed up healing but there are other things that companies are saying these things do. Since these types of pads hasn’t been out for all that long, many of the claims being made don’t exactly have proof to back them up. You should be able to find these heating pads in stores or at different websites. The most popular brand of these pads is Thermotex. They were the first to start marketing this type of product. Now because these things are a bit more expensive than regular heat pads, many insurance companies won’t cover them since there isn’t enough proof that they work any better than the less expensive heating products and methods. When looking at the different prices, you will see that these infrared pads will cost over $200 in some cases. This makes them quite expensive but if the claims are true, then perhaps they are worth the money. However, seeing that regular heat pads cost less than $20 in most cases, it can be hard to come up with a good reason to buy these types of pads. If you decide to use these pads, then at least try to find them for a good deal. Amazon sells these things so you might want to start there since they typically have the best prices. Thermotex is probably the brand to go with.